The Taggart and Green Wilson Huts sit near tree line (12,000 feet) at the top of the Castle Creek Valley in the shadow of Colorado’s Elk Mountains. The huts are part of the Alfred A. Braun Hut System, an arrangement of seven huts built for backcountry travelers and named after Fred Braun, the founder of Mountain Rescue Aspen. We were there for the water. Water is the most crucial compound of life as we know it. It accounts for 60 percent of our body’s composition and 71 percent of the earth’s surface. It’s the driver of civilization, sustainer of life and most importantly, the main ingredient of both snow and beer. 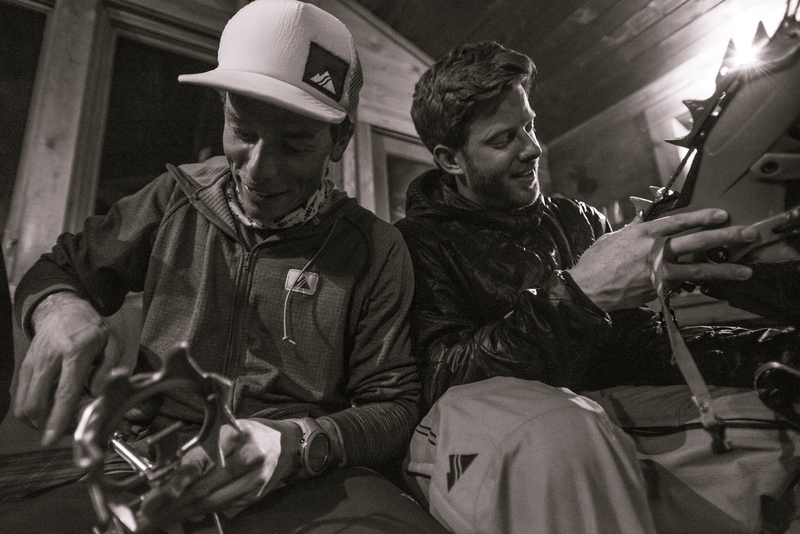 In April of 2015, I—made the trip to the cozy mountain shelters to trade secrets and skills, brew beer, and ski. The Taggart Hut was originally a dam tender’s cabin that burned down and was rebuilt by Braun in 1960. 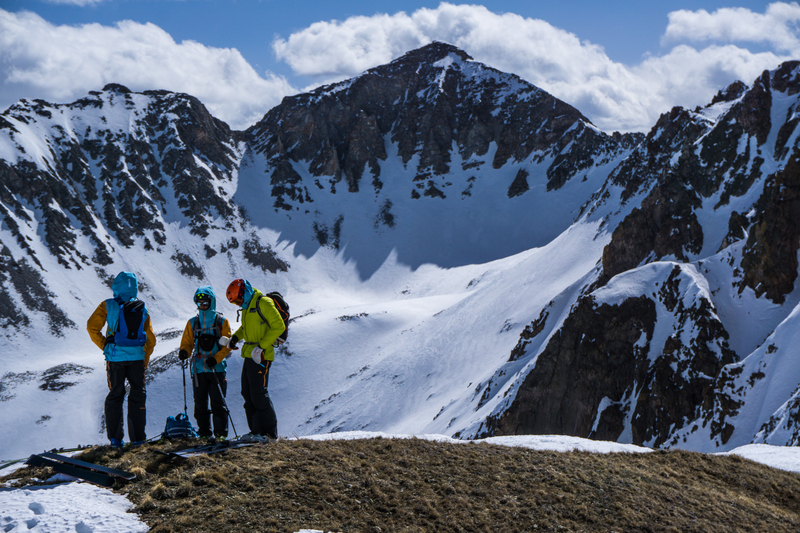 Both Taggart and Green Wilson reside at the base of some of the biggest peaks in the Rockies and provide an ideal access point for ski touring, mountaineering and the general enjoyment of life in the heart of the Elk Mountains. 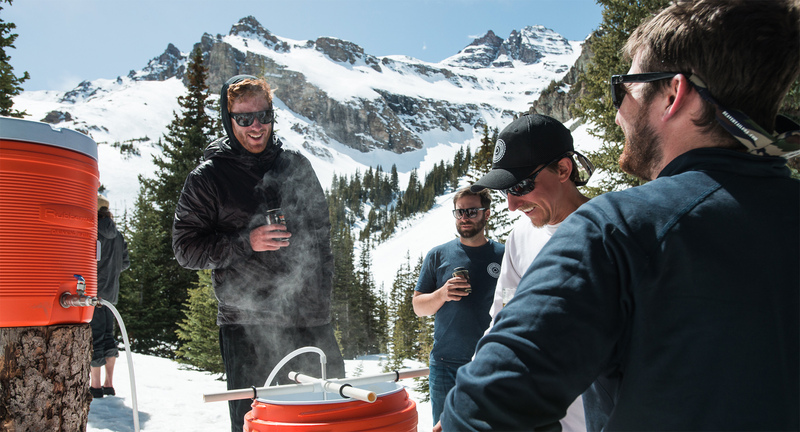 The same water that the dam tender in the original cabin controlled now fuels business for two Aspen, CO-based, skier-owned and operated businesses: Strafe Outerwear and Aspen Brewing Company. 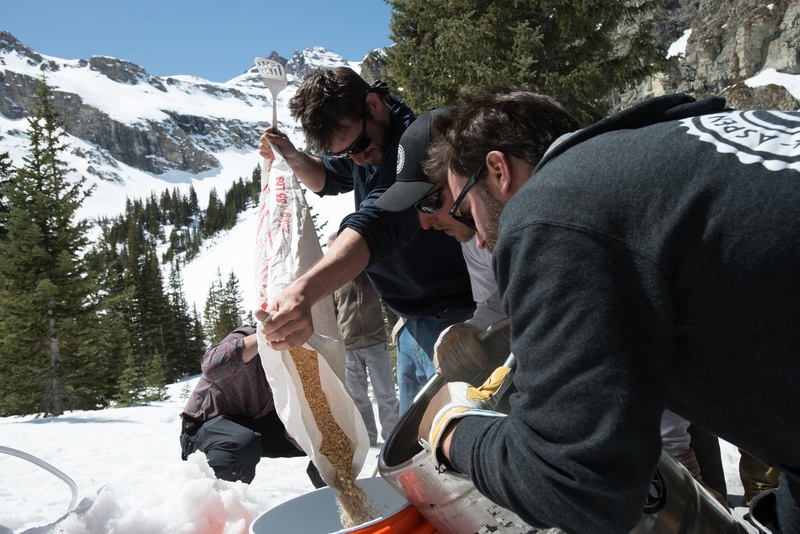 In April of 2015, representatives of both brands—and I—made the trip to the cozy mountain shelters at the source of Aspen’s drinking water to trade secrets and skills, brew beer, and ski. 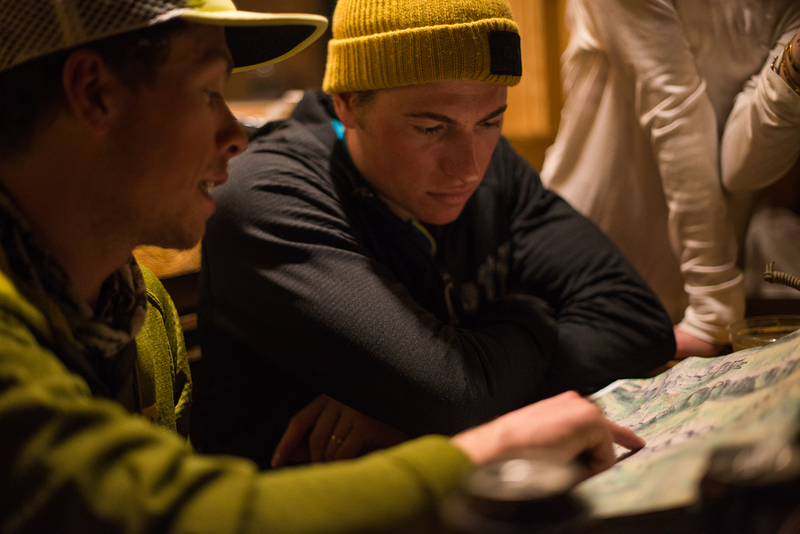 As the sun went down, after a hard day of shuttling people and gear from the end of the paved Castle Creek Road in Aspen, our group of 12 gathered tightly around a small, weathered table in the wood fire heated Green Wilson Hut. We drank beer, feasted on burritos and laughed about the struggles we’d endured that day. Willis Brown and Duncan Clauss of Aspen Brewing Co. conceived this trip as the perfect way to craft their newest beer offering. The idea was to pre-brew small batches of several recipes for their Silver City Ale. Beer is basically a combination of the same simple ingredients and processes used to make bread: Yeast, grain, heat, time and water. Aspen Brewing Co. alchemists PJ Goudreault, Kyle Vetter and Jeff Moreland brewed varied combinations of these to make four different recipes for consideration of what would become the new style; they used two different yeasts (one sour and one not) and two types of grains (wheat and hops) for differentiation. 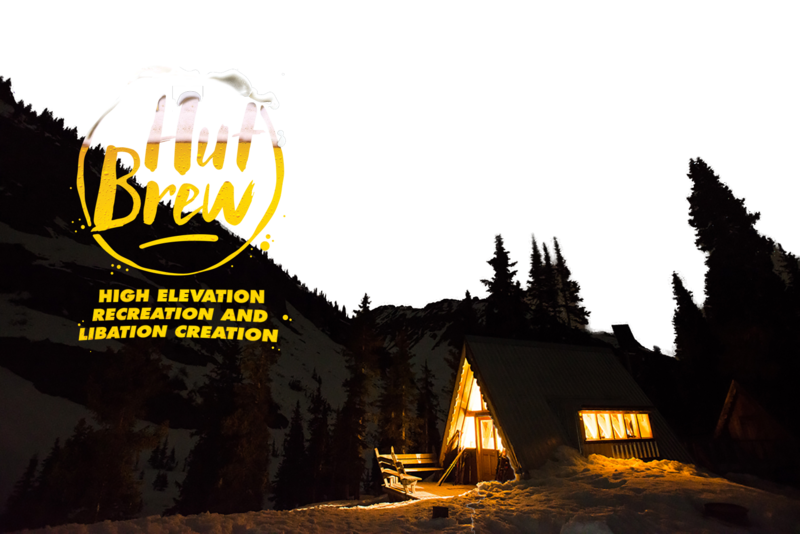 After climbing and skiing from the huts, the Strafe crew along with Clauss, Brown and I, planned to sit under the stars, buttressed by the Elk Mountains and sample each concoction. The group would vote on the best resulting combo and the first batch of Silver City Ale would be brewed with surprisingly uncomplicated home brew equipment, from snowmelt directly from the source.The first night as we sampled the prepared beer, Pete Gaston, co-founder of Strafe with his twin brother John, shifted into quiet and patient but pedantic guide-mode and explained the fundamentals of ski mountaineering to the brewery crew, mostly novices, for the adventure the next day. He helped fit everyone’s crampons to their boots, explained how to carry axes and the theory of self arresting—all skills that he would run the group through on-snow the next morning before they headed into the alpine. As we dispersed to our own huts we walked into the sharp, clear high-country air under a visible Milky Way. Smoke from the remaining coals in the stained black stoves snaked skyward and dissipated into black. The silhouette of Castle Peak, our objective for the next morning, towered above us, glowing in the faint moonlight. It looked impossibly huge and far away. The vague night-before nerves mixed with a warm buzz from good company and consumption. Sleep came easy. The next morning we awoke before first light to heavy winds battering the weathered walls. We briefly conferred and decided to postpone our start. The winds and clouds would keep the snowpack locked up and safe longer into the day and the extra sleep was needed. We cherished a few extra minutes in our warm sleeping bags before leisurely cooking oats with chocolate and espresso (Pete’s morning power recipe) and prepping for the day. The group snaked single file straight up from the hut and into the Castle Peak basin. We regrouped under bluebird skies at 12,600 feet and Pete immediately began running the group through self-arresting drills. 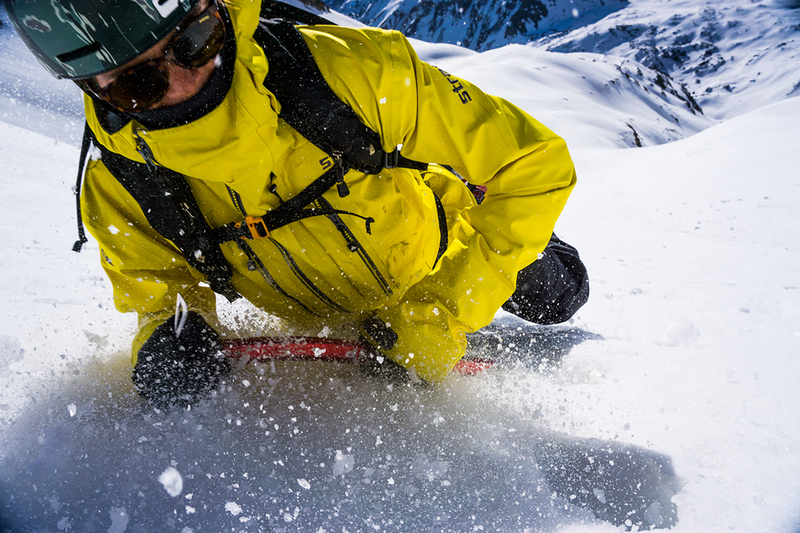 Self-arresting is an essential skill for traveling safely in the mountains that consists of using an ice-axe (ideally) to stop a sliding fall in steep terrain. One by one, experienced and novice, each member in the group threw themselves down the steep (but safe, with a clean run-out and flat bench below) slope and scrambled to safely bring themselves to a stop with feet facing downhill, belly to the snow, and axe point into the slope. Pete demonstrated once and then stood by watching, critiquing and teaching as the others hucked their bodies down the hill. Once everyone felt confident in their skills, we broke into three groups. The least experienced skied consolidated, surfy pow back to the huts for early beer tasting. 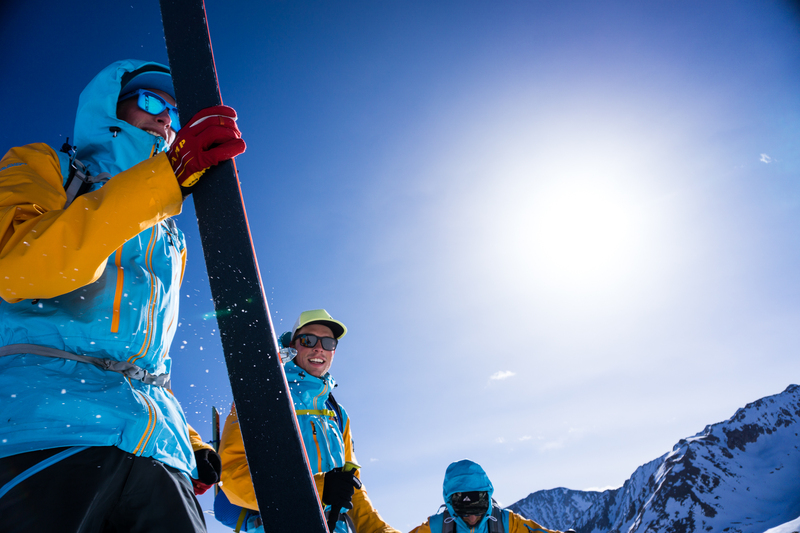 Those looking to continue climbing and skiing split between the Jeandarm Couloir and the East Face of Castle Peak, both beautiful and worthy ski lines that converged in the basin. Whit Boucher, Thayne Rich, Zach Hayes and myself started climbing the Jeandarm while Pete, John, Carl Walker, and TK headed to the true summit. The snow in the Jeandarm was a mix of heavier, water-laden snow and shaded cold smoke. again in the basin and all enjoyed 1,500 more feet of cruising, fun turns before joining the beer tasting on the sunny hut patio. All four combinations of the pre-brewed beer met the brewers’ primary criteria of tasting like a “session” beer, i.e. a beer you could drink several of in one sitting. The sour yeast was an unexpected twist for something crafted to be “easy drinking.” Sour beers tend to be sharp and puckering, more intended for savoring. Surprisingly, the sour blends were subtle and quite refreshing; they yielded a delectable aprés beer. Paired with the citrus flavors of the wheat, this became the obvious choice for the new style. The group vote was marked by opinionated ruckus, but together we finally made a call and began brewing. The first challenge was getting the water up to 150 degrees farenheit—the proper temperature for brewing at high elevation. Once the water reached this threshold, the grain—wheat in this case—was poured into the mash tun, a process known as mashing. A mash tun is a vessel used to convert the starches from grain into sugars before fermentation begins. A typical mash tun used by Aspen Brewing Company holds 620 gallons and is made of stainless steel. In our remote setting, we used a Gatorade jug. After the grain was mashed and sparged (a description for draining the liquid out of the mixture), we had the opportunity to sample the wort—sugar water, more or less. It’s beer before it ferments. It doesn’t taste anything like beer but you can taste some of the qualities the final fermented product will display. It was sweet yet refreshing and one could imagine it sold for its own merit. The wort was then poured in a keg and capped while the yeast did its work and turned the concoction into beer. While the first-ever batch of Silver City Ale began fermenting, we cooked dinner and enjoyed the company of friends under another clear, starry night. The next morning we would head back into the surrounding peaks for a bigger adventure toward Star Peak. We savored our time in an unlikely place, endeavoring to convert water—the most important compound in the known universe to life—into compelling photographs, stories and libations to celebrate the human spirit.